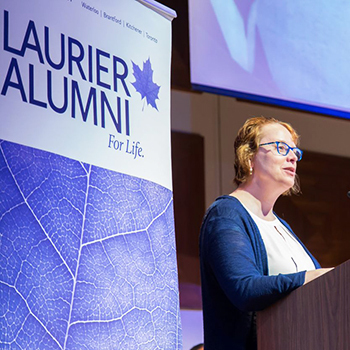 The Wilfrid Laurier University Alumni Association (WLUAA) honoured the recipients of its most prestigious awards, the Alumni Association Awards of Excellence, during a gala event in May. “These recipients are the people who are enriching the student experience and positively contributing to Laurier’s reputation,” said WLUAA President Marc Richardson, who presented awards to the honourees. A dedicated student volunteer since 2015, Curcic has devoted tremendous time as a kind and effective leader in the Laurier student community. She is the outgoing president of the Student Alumni Association. A quintessential entrepreneur who has been building and managing start-ups since shortly after his graduation from Laurier in 1991, Bogensberger travels the world to build disruptive businesses and passionate teams while making time to mentor the next generation of innovators. "These recipients are the people who are enriching the student experience and positively contributing to Laurier’s reputation." Ritchie has volunteered her time with over 20 Waterloo Region organizations, spanning sectors including education, commerce, health research, community development, and heritage. She started Random Act of Kindness Day in 2008 and since 2000 she has raised more than $3 million for local non-profits as part of a personal millennium project commitment. Laurier President Deborah MacLatchy speaks during the Alumni Association Awards of Excellence. Oldfield is a tireless and enthusiastic advocate for Laurier and was recognized as one of Laurier’s 100 Alumni of Achievement during the university’s centennial year in 2011. She has made significant contributions to the business community throughout her career with AIG Canada and is thoroughly involved with Laurier as a mentor, volunteer and employer. Lovett has a long record of excellence in academics, athletics, business, and charitable involvement. He is one of the youngest lawyers to make partner at his firm, where he handles multiple pro bono clients, and is the youngest-ever chair (now past chair) of the Brantford-Brant Chamber of Commerce, in addition to maintaining an admirable schedule of community engagement and volunteerism. Smith is an accomplished business executive who has found success by focusing on the human elements of work: collegiality and collaboration. Her research while completing her master’s degree at Laurier focused on the human factors of business beyond technology and made a significant practical contribution to the Canadian innovation community. Bryce and Nancie Walker provided the vision for the Music Therapist-in-Residence program launched at Laurier in partnership with Homewood Health Care in Guelph. They not only identified the potential for the partnership focused on therapeutic mental health support and training, but also made all the introductions and provided the inspiration, motivation and critical resources to make it happen. To learn more about the Awards of Excellence or find nomination information, visit the Laurier Alumni website.